Mac n' Cheetos return to Burger King for a limited time at participating locations starting Thursday, May 18, 2017. 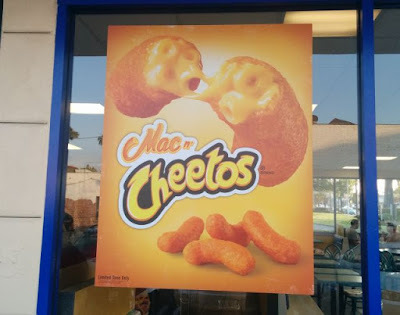 The returning deep-fried snack features a somewhat Cheetos-shaped stick with a mac and cheese core covered in a crispy Cheetos-flavored shell. They were first introduced in June of last year and were apparently popular enough to merit a return. Burger King's Mac n' Cheetos come five pieces to an order for a suggested price of $2.69. You can find my review of them here. Photo by Q / Brand Eating.